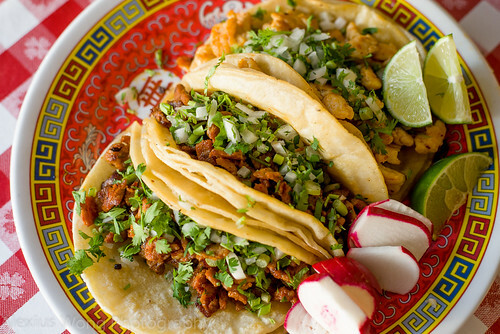 Authentic Mexican cuisine falls under the same category as Chinese: elusive in the DMV area, corrupted (at least most of the versions served here), and revelatory to the uninitiated. For a long time, I have kept a deep secret – a Mexican restaurant serving REAL Mexican food, located in the heart of Mexican immigrant community in the Edmonston neighborhood, PG County. 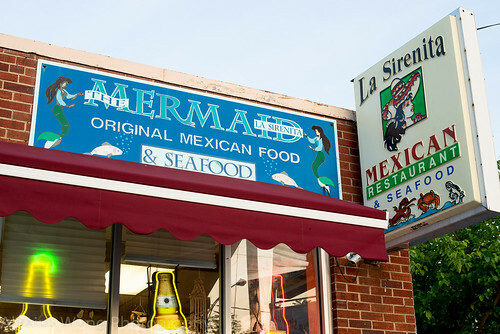 I discovered La Sirenita during my teaching breaks from a Catholic girls school just uphill, and I had inquired the store owners of a Mexican grocery store where to eat after purchasing some home-made Mole sauce. Without hesitation, they pointed me towards her doors and it is where I entered numerous of times when I was in the mood for the veritable thing, staying away from Tex-Mex versions assuming such guise. Finally, I have decided to divulge this well-guarded information. So here are some of my favorites in this locale. Walking into this establishment, you know you have stepped into a different world. English is a minority language here (the waitresses are perfectly bilingual) and the non-Mexican face scarce. The menu is written in both languages but remains a bit inaccessible for those unfamiliar with the cuisine. What adds to the ambience is the jukebox pumping out loud Ranchera music with its characteristic polka-like beats interspersed by equally loud Mariachi music wailing out one’s miseries like the Blues. This would make one reach for a Corona or Dos Equis to either revel in the festive mood or drown one’s sorrow. But on nearly all occasions, my friends and I choose the non-alcoholic versions. 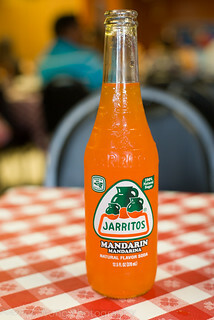 Jarrito is the Mexican soda made with natural flavors and most importantly, natural cane sugar, unlike the high fructose corn syrup found in American soda. They come in all different fruit flavors along with their day-glo color which probably is the only non-natural element in it. This soft drink is more satisfying for its fruity element as well as the naturally filling sugars found in it. For a non-gaseous drink, I prefer to order Agua de Tamarindo. 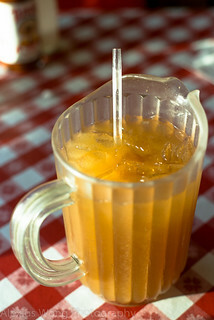 A mini jug arrived to the table filled with a concoction made from tamarind pulp, tasting slightly sour, quite fruity with a clove-like note, and slightly sweet from a judicious addition of sugar. A previous order has been Horchata which is a sweet rice and milk drink punctuated by notes of interest brought by cinnamon powder. There is a selection of fruit shakes that are worth venturing also. There are a few appetizers or small-bites worth starting off your meal here and they are seafood based. The first is Tostada de Ceviche. 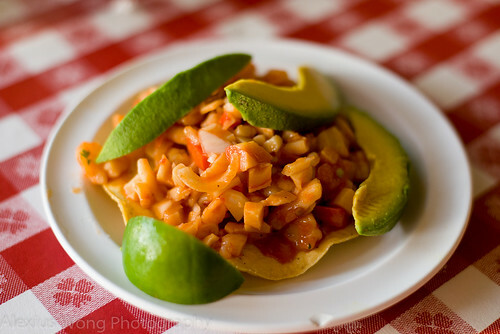 A crispy fried corn tortilla is topped with a melange of squid, scallop, and faux crabmeat, all brought together by a tomato-based sauce spiked with a good hit of hot sauce, made tart with some lime juice, and fragrant with some cilantro. All the pieces of seafood were well-cooked without being tough or chewy and they tasted well-marinated in the spicy tart sauce. The perfectly ripe avocado slices provided the rich element to each bite as well as a softer contrast to the seafood and crunchy tortilla. This is definitely a very satisfactory meal-opener. An equally appealing order is Coctel de Camaron. This is a far cry from the Shrimp Cocktail that most have grown up on. 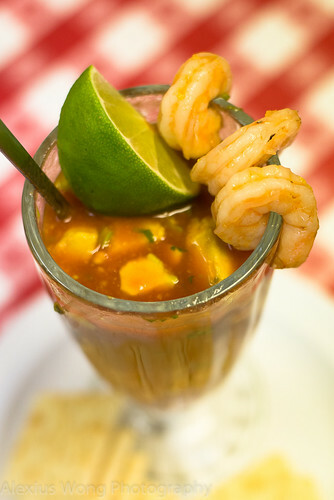 Here fresh tasting small-sized shrimp are paired with cubes of soft and rich avocado, swimming in a pool of sweet and tart tomato sauce, spiked with hot sauce, and made slightly pungent with bits of fresh onion. Saltines are provided to add some starch to the seafood as well as add some relief (along with the rich avocado) to the bold sauce that tends to envelop all the taste buds. Another worthwhile order. Tacos here are the order of the day. Again, this dish made the authentic way will dispel one’s notion of what it is. They arrive with a double layer of fresh and soft tortilla tasting recently made and exuding its corn-goodness much like ground hominy. The filling is made with marinated chunks of meat, not the usual ground meat, cooked on the flat grill and nearly greaseless but tasting savory. Here, these wraps are served with some limes and topped with a generous amount of sweet onion and green onions and cilantro – that simple. Maybe a touch of the fiery red chili or green chili sauces would be the additional dressing, but not the slathering of salsa that we are accustomed to. The pork and chicken versions hit the spot for my BFF who loves their rendition here and makes it a point to join my group when we visit here. 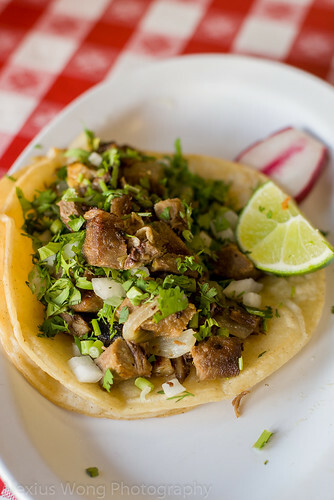 Other versions made with barbecued goat, Barbacoa, and cow’s tongue, Lengua, are indicative of the level of authenticity one finds here. I quite enjoy the slight gaminess and chewy texture of my order made with tongue despite it being a bit fattier than the usual cuts. A couple of other small bites are worth considering. 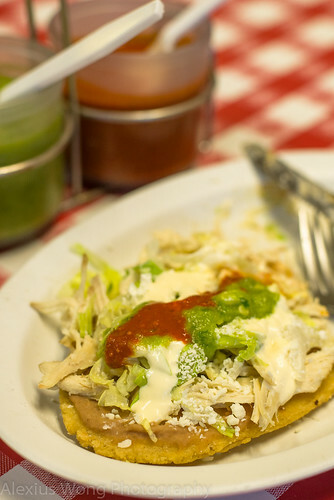 Huarache is a grilled white corn cake much like a Johnny cake found in the South. The topping is a slathering of refried beans, some meat (chicken, beef, or no meat), some shredded lettuce and onion, and finished with a drizzle of Mexican sour cream, crema, and crumbly cheese, queso fresco. I enjoyed this plateful with the texture and taste of the corn cake, the smooth refried beans, and the milk products, with the mild crema and equally mild crumbled cheese tasting innocuous from not being aged. A few drops of the red and green chili sauces added the necessary punch for this diner, and it was satisfying indeed. An order of Tamal was made on one occasion. 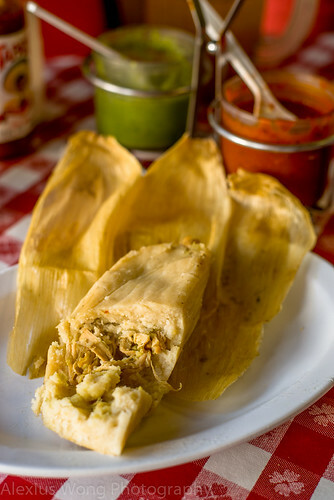 They come either with a stuffing of pork and red chili sauce or chicken with green chili sauce. The cake arrived wrapped in corn husk, exuding more of its corn goodness into the savory cornmeal cake. The stuffing of chicken and green chili was a bit dry but sufficient to balance out the starch and it had a bit of piquancy to it. However, the cornmeal was quite dense compared to the Salvadoran versions that I have a penchant for. The slightly dry corners were an indication that they had been microwaved, thus making them drier than what they are supposed to be. Maybe spending some time in the steamer would have made these more enjoyable. For the main course, one of my favorites is Mole Poblano. Pieces of chicken arrived slathered with the Pre-Columbian sauce that is quintessential to authentic Mexican cuisine with the use of ingredients indigenous to Meso-America: dried chilies, several types of roasted seeds including pumpkin and sesame seeds, and finally a surprising ingredient – chocolate. With this dish, the chicken plays the supporting role to this incredibly complex sauce with its nuttiness, spiciness, and a depth from the unsweetened chocolate, tasting fresh and house made. The side of steamy tortillas is necessary to mop up every drop of that elixir that I cannot get enough of. The other sides of Mexican rice and cooked pinto beans are decent and tasty, but overshadowed by the Mole. Another version of this dish is Enchiladas de Mole. Tortillas are stuffed with shredded chicken mixed with the Mole sauce and topped with lettuce, crema, and queso fresco, fresh Mexican cheese. This dish is a definite hit for me and my friends. 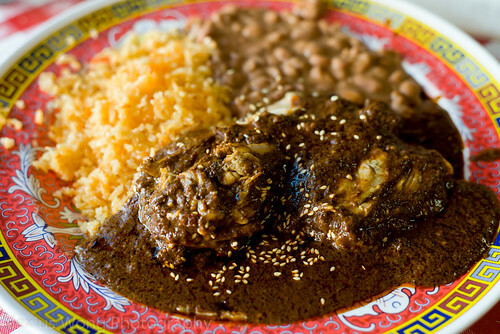 When in a good Mexican restaurant, go for the Mole dishes when the sauce is this delicioso! A seafood main course that we have tried is Camarones a la Plancha. Shrimp is cooked on the flat grill with pieces of onion, shell-on or off. A strong point in this house is the freshness of its seafood and this dish does not fail on that count. The butterflied and deveined shrimp tasted well=seasoned and still moist from the grilling with slivers of cooked onion adding some sweetness to each bite. My friend prefers his order with the shells on since he finds it too salty without the shells. In addition, cooking shrimp with shell on helps to keep it moist. This dish is worth digging your fingers into it, tasting the seasoning on the shell, and enjoying the seafood sweetness of each morsel. 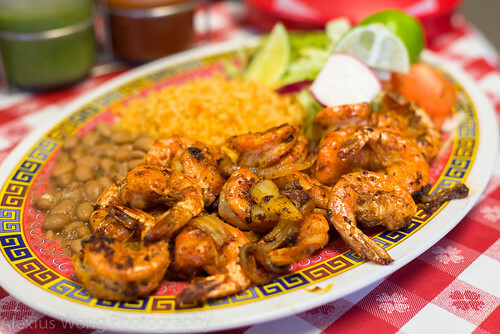 Another dish worth ordering is Camarones a la Mexicana. Pieces of butterflied and shelled shrimp come covered with a tomato-based sauce that is devoid of its acidic nature and enriched by a good dose of garlic that makes each drop worth savoring. Seafood dishes are strong suits here since the cooks execute the fresh sea ingredients skilfully in their offerings.